Looking for Pallet Racking Solutions in Bradford? Over the years we have worked upon many projects for customers spread across the Bradford and wider West Yorkshire region. Bradford is known for its urban grit and was once the epicentre of the global woollen industry and has much impressive Victorian architecture as reminders of it’s pre-eminent past. In recent times it has been awarded the accolade of the curry capital of the UK! If you are a business based in the Bradford or in the wider West Yorkshire area and are looking for industrial storage solutions such as pallet racking, our bespoke approach with products such as push back pallet racking, double deep pallet racking, narrow aisle pallet racking, drive in or external pallet racking then we would like to think that you have landed onto the right website. All our services are bespoke in nature and we are able to provide bespoke storage solutions whatever your requirements, just fill out the enquiry form or better still call a member of the team on 01423 819 057 for an initial chat. 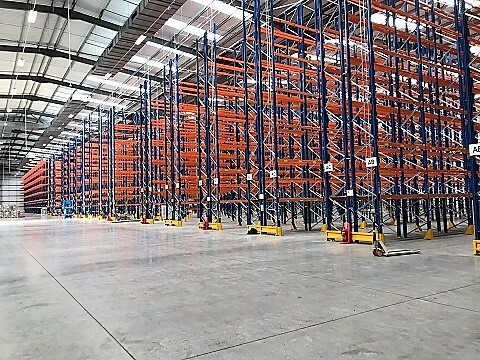 Warehouse Storage Solutions have been trading for many years and are proud to have worked with some of the biggest and best known companies, delivering cost effective pallet racking solutions to customers in the Bradford and West Yorkshire region for over ten years. Better still we are based in Yorkshire and have many satisfied clients in the area. There is no one size fits all approach, you will find that all our solutions are bespoke so there is almost no restriction when it comes to finding the perfect solution for your needs. It is not just pallet racking we offer We also offer an extensive range of shelving options as well as having the capacity to design and build Mezzanine Floor solutions, so if you are based in Leeds or West Yorkshire and need a trusted and professional supplier of pallet racking or storage solutions then call a member of the team today on 01423 819 057.